Perhaps the most recognizable scene of Jackson Hole is the historic Moulton Barn, weathered over a century and still standing. Testimony to the steadfast nature of Mormon settlers traveling West in search of religious freedom, this barn has become an icon for the valley. 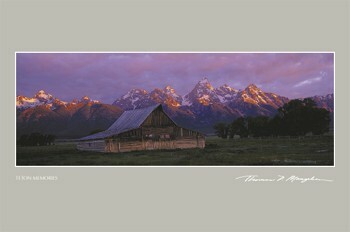 Receive a complimentary Century of History Moulton Barn Collector's Coin with Mangelsen's Teton Memories - The Moulton Barn Limited Edition print purchase. Platinum Level Image - This image has less than 75 copies left in the Limited Edition. Order yours today to ensure that you can add this image to your art collection!